The Goboist: PHOTOGRAPHERS, LOOK BEHIND YOU—IT MAY BE THE BEST VIEW! PHOTOGRAPHERS, LOOK BEHIND YOU—IT MAY BE THE BEST VIEW! Even after 50 years doing fine art photography I still remind myself, when I’m outside on a session, of that simple old adage some photographer said, “Look Behind YOU, when you’re walking, it may be the best angle!” And it’s so true—I can’t tell you how any times I’ve walked down a trail at a national or state park not being jazzed about what was in front of me and then I turned around to see a stunning scene. It’s the same basic subject—I just walked by it! But, from the reverse angle now the Lighting is Magical! There are those photographers that look but don’t see the best view or angle of a subject. Many times they just use the “scenic turnout” and Lemming-like they copy the view that thousands of tourists have photographed before. Then there are those (way too many I might add!) photographers that just don’t see the light, and by that I mean the Good Light—Directional Light. All light isn’t equal in fine art photography (or any art). We as photographic artists must know not only from where, but when to capture the image. Here’s an image of mine that illustrates ALL these points…. One of my passions, here in Idaho, is the photography of old, derelict, tractors. 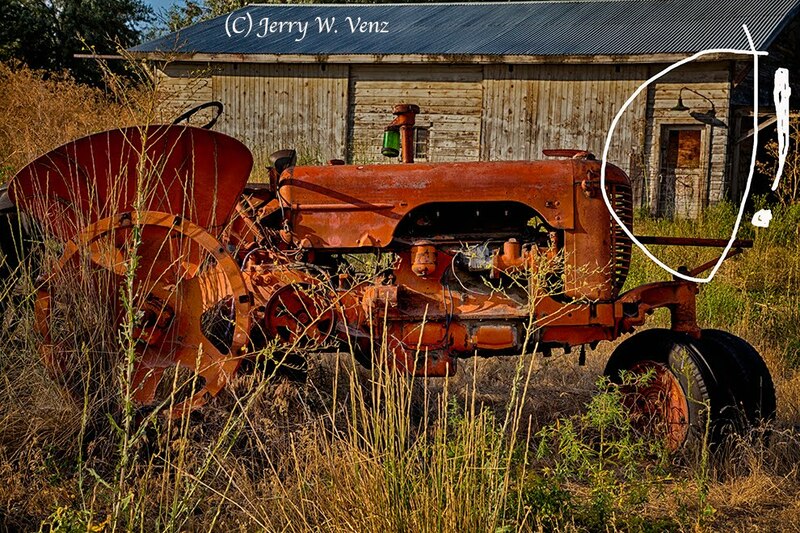 So, when I came upon this old tractor, on the side of the road, one morning, I pulled over and got to work. Walking up to the tractor (the view you see here) I looked behind me to find a spectacular sky and clouds that had to be the background for the tractor! Then I turned around again to compose this view and did a bunch of images and because I was so fixated on my tractor I had missed what was right in front of me in the background! 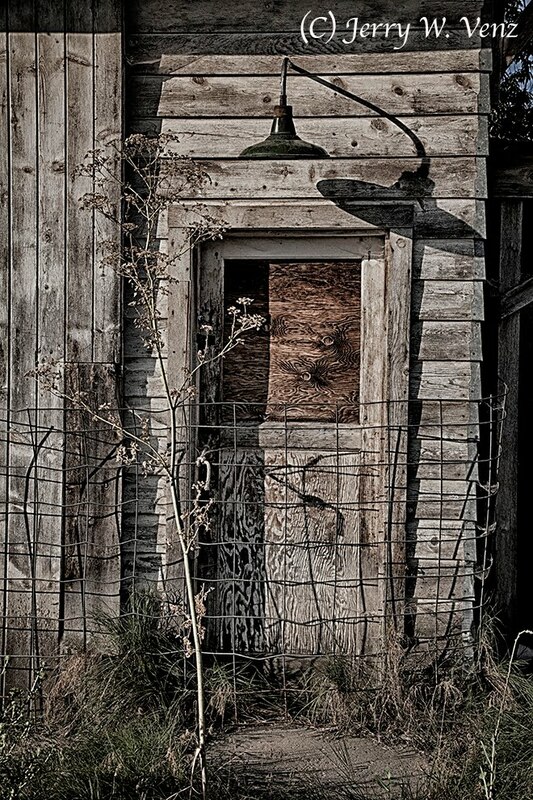 That old door was Great—but what attracted me to it was the shadow of the Lamp over the door—that’s my kind of Lighting! 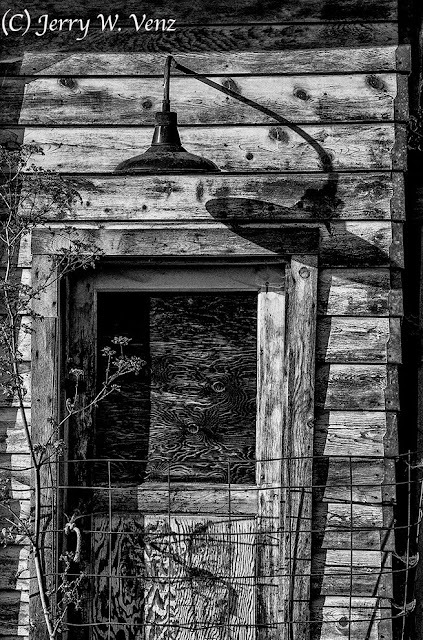 I started with this full view of the doorway and that great overhead lamp and shadow being created by nice Directional Light at 8:30 in the morning—a time I’m rarely up for photography! I tend to do most of my outdoor photography at the other (evening) magic hour. Here’s a Black & White crop of the same image…. My Black & White conversion was done with NIK’s Silver Efex Pro II using the “wet rocks” preset that I modified to MY B&W tastes. This crop makes the lamp and shadow really stand out as the primary center of interest. I guess I’ll have to do a Blog on the main reason I stopped to Photography the tractor. ’Til next time…and none of us forget, Look Behind YOU, but also pay attention to what’s right in front of you too!